On Saturday 30th January, a meeting was held at the London Oratory to launch a new grouping, the Gregorian Chant Network, of scholas and interested parties to coordinate the promotion of Gregorian Chant in the Catholic liturgy. The meeting was opened and the concept of the GCN introduced by Joseph Shaw, Chairman of the Latin Mass Society. After lunch Colin Mawby, the distinguished composer and former Director of Music at Westminster Cathedral, gave the keynote address on the importance of Chant, followed by a fascinating practical session on methods of conducting the Chant, embedded below (40 minutes). 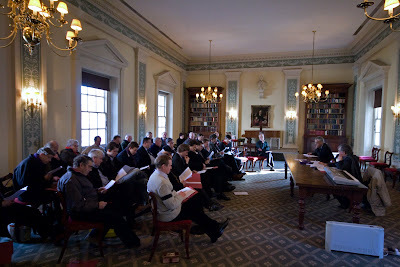 The meeting was attended by members of the Latin Mass Society, Una Voce Scotland, the Association for Latin Liturgy, the Schola Gregoriana of Cambridge, a number of chant teachers and experts, and the Directors of a score of Gregorian Chant scholas from all over the country, 36 people in all. The meeting concluded with First Vespers of Septagesima Sunday in the Little Oratory, led by Fr Anthony Alexander. Following the successful three-day chant course with Nick Gale organised by the St Catherine's Trust last spring, we have organised another for April 9th to 11th (Low Sunday). As before it will take place in conjuction with the St Catherine's Trust Family Retreat; this year the venue will be the Oratory School, Berkshire, which is between Reading and Oxford. Nick Gale is the Director of Music at St George's Cathedral in Southwark, and trained under Dom Daniel Saulnier in the chant at Solesmes. This year he will be assited by Mr Mark Johnson to enable the singers to be divided into different groups to suit all levels of experience. The feedback from last year's course, which included an introduction to semiology through the Graduale Triplex, was enthusiastic: it gave the participants, few of whom had ever encountered the Graduale Triplex before, a fascinating and very practical new perspective on the Chant. This course, in its length and scope, is unique in the UK and should not be missed by anyone interested in singing Gregorian Chant. It is also a very good deal at £80 per person (payable to the St Catherine's Trust). All are welcome. The Gregorian Chant Network exists in part to organise Chant training. Our approach is to organise events open to all, which are large enough to allow different groups for 'beginners' and 'more advanced/experienced' singers. UK sources for newly printed books about Chant, as for books of Chant, include St Michael's Abbey (Farnbrough). For some of these books you may need to try Amazon or searching more generally. These are all short introductions to the Chant which I (Joseph Shaw) have happened to have read and found interesting; notes on other books very welcome. Free dowload: tells you the basics about where the semi-tones are and why you should be singing Chant from square notes. Online here. Tells scholas exactly when, what, and how long to sing at the Extraordinary Form. Psallite Sapienter: A Musician's Practical Guide to the 1962 Roman Missal, by B. Andrew Mills. Helpful tips on the rules governing the 1962 Missal. A more detailed form of the previous entry. Square Notes: A Workbook in Gregorian Chant, by Sister M. Judith O.P. This is how it was done in the 1950s. A truly didactic book, intended for schoolchildren, but going as far as explaining how to distinguish the modes and 'how to place the ictus'. Based entirely on the 'Old Solesmses' method, and fascinating if you wonder what the curly lines on the examples of chant in the introductory pages of the Liber Usualis mean. Helpful tips on running a schola; written with monastic scholas in mind. Particularly useful introduction to the modes. Two translations of the same book. Dr Berry's translation is better, but harder to find (see Amazon, or contact the publisher, Paraclete Press, directly - see comment, below). More substantial than the others, excellent introduction to the history of the Chant, notably explaining what it means to say a chant is in one mode rather than another. Good short introduction to the history of the Chant followed by illustrated explanations of the squiggles in the Graduale Triplex, and how they help you to sing the Chant better - not something tackled in any of the other books. The GABC Transcription Tool will create pdfs of a huge number of chants, according to the melody given in the Graduale Romanum and according to whatever Psalm-tone you like. It also does the lections. All the basic chant books have been scanned and made available for free download by the Church Music Association of America. There are masses of things on two pages of their website: Music Downloads and Literature for Download. The main ones are listed below. No doubt there will be more as time goes on. They are all pdf files, many of them extremely large. A number of these can be bought as hard-copy reprints from Lulu.com (see below). In addition to the Offertoriale edited by Ott, which is available as a dowloadable pdf (see the list above) and as a reprint from Lulu (see below), there is an on-going project to put online newly edited versions of these verses on a German website, Gregor & Taube, alongside a complete Sunday Graduale for the Ordinary Form of the Roman Rite, edited from early manuscripts. Windsor Latin Mass (from Missouri, USA) is in the process of putting up the written chants necessary for priests: Collect, Epistle, Gospel, Postcommunion, in the different versions (festal and solemn, 'antiquus' and 'ad libitum'). These are beautifully clear sheets with the entire text set to the square notes. An on-going project. You can now buy a book of these, suitable for use in the liturgy, for all the Sundays of the year: the Canticum Clericorum Romanum. See a review here. Also available for download is the 1974 edition of the booklet Jubilate Deo, which Pope Paul VI intended as a minimum chant repertoire for parishes. It is available here in various formats. There are a lot of interesting historical editions of chant books which have been scanned and can be downloaded for free, provided by Corpus Christi Watershed (there is an overlap with the CMAA list above). 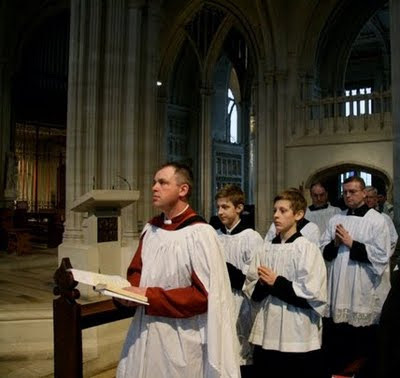 The Latin Mass Society now has a set of chants for the feasts proper to England and Wales, which are otherwise difficult to find. They also have other resources for chant scholas which are worth looking at. UK sources for newly printed chant books include St Michael's Abbey (Farnbrough) and Cenacle Catholic Books; St Philip's Books of Oxford has some new books, and is a good source for second-hand chant books. The CMAA's page on Lulu has a lot of useful things, including a reprint of the 1961 Graduale Romanum, which is particularly difficult to find (though some edition of the Graduale is essential if you want to sing ferial days in Lent, which do not appear in the Liber Usualis), in two volumes, hard or soft bound. Lulu is a 'print on demand' company: they don't carry stock, but will print any book given to them in pdf form if it is ordered. Although it is based in America, UK buyers seem to get books at high speed from a UK printer. There are steep discounts for larger quantities. The Abbey of Solesmes sells a number of their own books directly. Libreria Editrice Vaticana, the Vatican publishing house, has a growing range of historic reprints as well as books for the 1970 Missal. The basic book for most Chant purposes is the Liber Usualis. This can be bought from a UK supplier for £79.50 from Cenacle Catholic Books. The Latin Mass Society site includes a wide selection of Ordinaries, the Asperges, and a number of other useful chants. Good quality. Searching for keywords in proper prayers will often turn up MP3 files of someone singing the chant setting. It is worth searching YouTube, Vimeo and GloriaTV for videos as well. There are a couple of sites which have attempted to produce a complete set at least of Sunday Masses and important feasts, but these projects are far from complete. Saint René Goupil: excellent quality, covers the whole year of Sundays for Introit, Offertory and Communion. Windsor Latin Mass (from Missouri, USA) is in the process of putting up the written chants necessary for priests: Collect, Epistle, Gospel, Postcommunion, in the different versions (festal and solemn, 'antiquus' and 'ad libitum'). These are beautifully clear sheets with the entire text set to the square notes. Another on-going project. The Fraternity of St Peter (FSSP), using the sheets created by Windsor Latin Mass, has MP3s of the Epistles and Gospels for Sundays and feasts throughout the year. Another on-going project. A CD of the most common and useful chants was produced by the late Nick Gale, see the Gregorian Chant site. There is a complete set of Sundays and a range of Feast days, plus the whole Kyriale, available (at a price) on CD from the Schola Bellarmina of Brussels. The quality is excellent.